Tuna fits into a healthy diet or weight-loss program as a source of lean protein that also supplies vitamin D and omega-3 fatty acids. 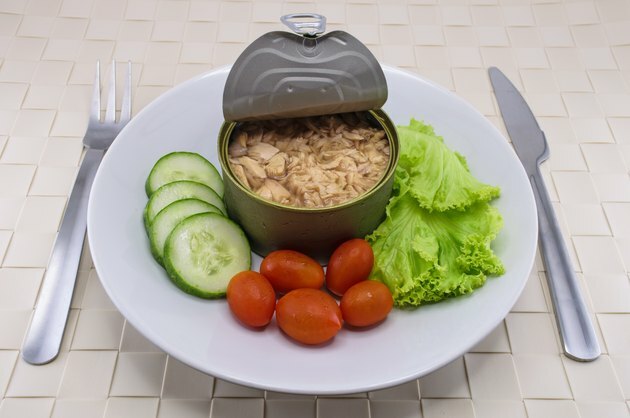 Canned tuna is a convenient food to keep on hand for a quick meal. The canned version of this seafood also is affordable, making it a budget-friendly diet food. Traditional tuna salad recipes include high-fat mayonnaise that adds unnecessary fat to the dish. Replacing the mayo with a healthier option and bulking up the dish with other nutritious ingredients gives it a makeover fit for any diet. Drain the water from the canned tuna. Avoid oil-packed tuna that increases the fat content of the dish. Pour the tuna into a large bowl. Add chopped or shredded vegetables to the tuna. Try celery, onions, artichoke hearts, peppers, olives, tomatoes and shredded carrots. Stir in just enough plain Greek yogurt to moisten the tuna and help it stick together slightly. Greek yogurt is source of protein and is fat-free. Other options include plain fat-free yogurt or fat-free mayonnaise. Squeeze in 1 to 2 tsp. of fresh lemon juice. Stir the mixture to integrate the lemon flavor. Sprinkle dry seasonings into the tuna mixture. Options include pepper, chili powder, parsley and garlic powder. Stir in fresh chopped herbs for more flavor. Use cilantro, basil or parsley. Serve the tuna salad on a whole-grain pita or on large lettuce leaves.